These days, Sony is all about using PlayStation Home as much as possible to promote this that and the other product or event. 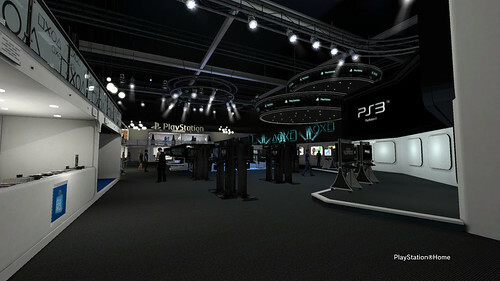 This year, users could visit Sony’s E3 booth in PlayStation Home. One of the reasons I continue to check in on Home is to see how Sony and other companies are using the space. 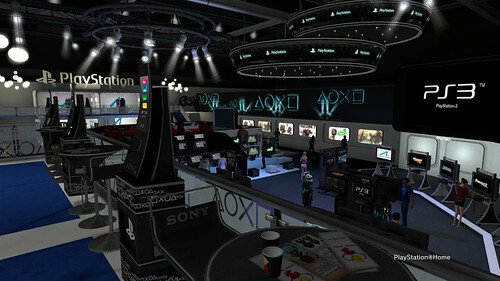 Like many Home spaces, Sony’s virtual E3 booth allows users to view trailers for some of their top tier games like Little Big Planet. 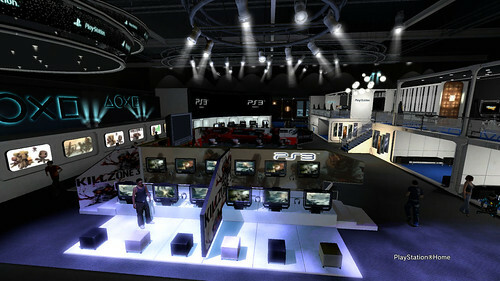 If you viewed all seven available trailers, you gained access to the VIP area of the booth—where you could obtain special E3 2010 items for your avatar. This screen shot above is the view that greets the visitor upon loading into this space. Most of those monitor stands are for show, however a large screen to the right of that big PS3 sign played trailers and promo reels for games and new products like the PlayStation Move. This shot shows the booth from the rear. The gaming stations on display here are mostly non-interactive, though some of them will allow you to view trailers. The alcoves on the right display promotional images, and one of them contains a trailer. This last screen shot is taken from the VIP section on the upper level of the booth, and shows the rest of the booth down below. In the VIP section, there were more promotional displays as well as more opportunities to watch trailers. Something that I think is really cool about a lot of these Home spaces are all the little details. In the foreground of this shot, you can see E3 branded coffee cups and brochures scattered on the table. Upon my first visit to the VIP section, I received a pair of E3 goggles for my avatar. They’re bulky opaque sunglasses on which TV static scrolls. Not very attractive. When I visited the VIP section a second time, I was rewarded with an E3 outfit. Again, it’s not something I’d have my avatar wear, because she already has a cool Alien costume. However, I believe this E3 outfit is pretty popular with people because it features a unique lighting effect that you get, for the most part, on purchasable attire. The outfit is basically a black Tron-like suit, with aqua blue pulsing lights coursing along stripes on the costume, and the E3 logo on the front and the back of the costume. You can take a look at that costume, as well as an official video about the virtual booth, at the YourWorldInHome site. Reading this post, I’m curious about your engagement with Sony’s E3 promotional material through Home. I haven’t had much of an exposure to Home, but I have some familiarity with the embedding of promotional material within virtual worlds. What is it that makes consuming this material through the medium of Home attractive? What’s the appeal over viewing the same material on websites like GameTrailers.com? Is there material that’s only available through Home? @ Adrian: As for the game trailers at the virtual E3 booth, they are not exclusive to Home. Only the virtual items you obtain for your avatar are exclusive. For me personally, I’m not actually particularly interested in those trailers shown in the virtual E3 booth. My interest in Home in this instance lies in the execution of marketing promotions. I’m actually only fully engaged with brands or products in Home in cases where I’m already interested in them outside of Home. For example, the UNCHARTED: Drake’s Fortune and UNCHARTED 2: Among Thieves Home spaces, the Aliens costume, and The SingStar Rooms Home spaces. I like being able to connect to those brands and products in ways that I am unable to on their websites. Viewing trailers and screen shots on official websites is cool, but Home gives me a way to interact with games I love in new ways. I can play mini games in the UNCHARTED 2 Home space. I can buy an Alien costume (for Aliens vs. Predator the game) and use that as my identity in Home. And if I had friends who still logged into Home, I could connect with those products with them through those spaces. I also just enjoy the virtual people watching. I like seeing how people interact in Home. Sometimes it’s terrible and very awful (verbal abuse, harassment), but sometimes it’s fun (dance parties, everyday chatting).